The Reasoning Voter is an insider’s look at campaigns, candidates, media, and voters that convincingly argues that voters make informed logical choices. Samuel L. Popkin analyzes three primary campaigns—Carter in 1976; Bush and Reagan in 1980; and Hart, Mondale, and Jackson in 1984—to arrive at a new model of the way voters sort through commercials and sound bites to choose a candidate. Drawing on insights from economics and cognitive psychology, he convincingly demonstrates that, as trivial as campaigns often appear, they provide voters with a surprising amount of information on a candidate’s views and skills. For all their shortcomings, campaigns do matter. 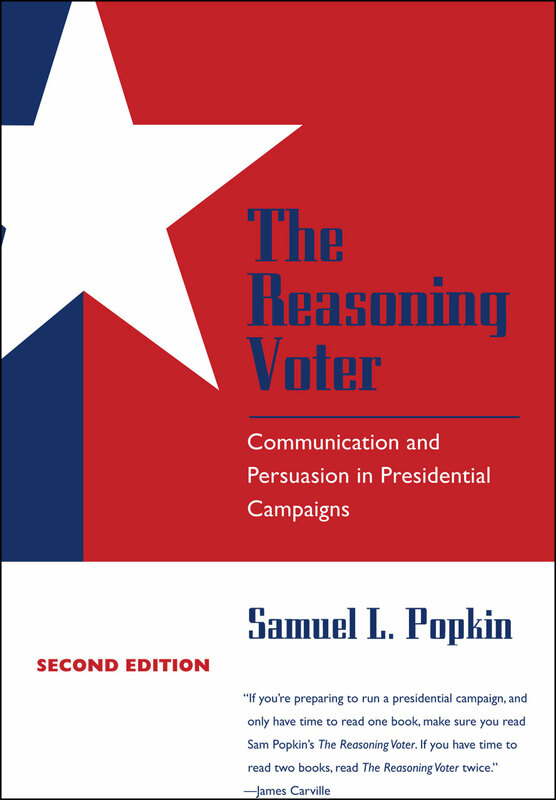 "If you’re preparing to run a presidential campaign, and only have time to read one book, make sure to read Sam Popkin’s The Reasoning Voter. If you have time to read two books, read The Reasoning Voter twice."